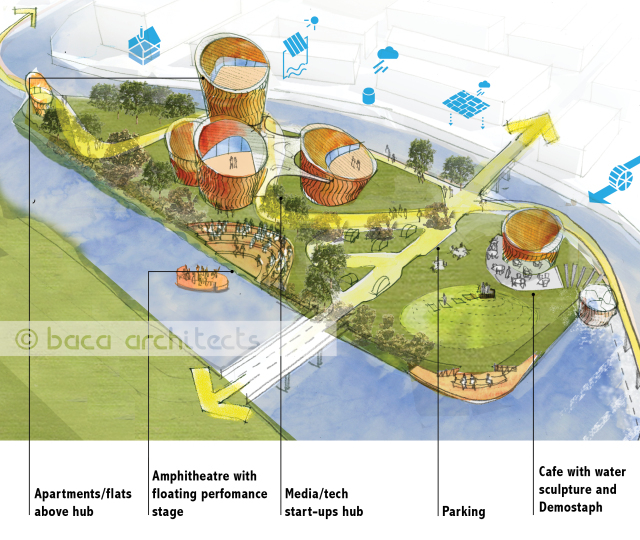 Baca’s submission proposes a high-tech mixed-use and cultural hub @ Soar Island, inspired by the former use – Flour Mills. The ‘mill wheels’ become the modern wheels of industry in this high tech hub and provide form to the pavilions, with a new cafe, a centre for start up businesses and residential flats interspersed into a vibrant waterside island setting. United by the flows of movement through the site, the holistic strategy for the island builds on existing linkages that weave through the site to create unique settings for a variety of activities that become destinations in their own right. Water is a key feature, with a waterside plaza, amphitheatre, canal boat moorings, revolving cafe cantilevered over the water and best of all, a innovative ‘horizontal water wheel’ – a unique feature.